This 2-hour scenic cruise on the tranquil, reflective waters of Lake Mapourika offers postcard-perfect photo ops from the boat’s viewing platform. Admire a sweeping panorama of the Southern Alps and Franz Josef Glacier while you listen to live commentary about this scenic gem. Upgrade your tour to include a bush walk through some of the last remaining Kahikatea rainforest and visit the Okarito Kiwi Sanctuary, home to the rowi, New Zealand’s rarest kiwi bird. Select a morning, afternoon or evening departure. 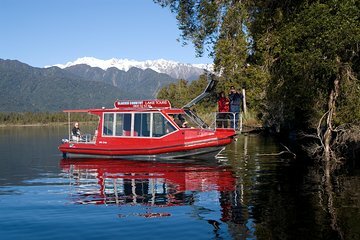 Your Franz Josef Accommodation or Glacier Country Lake Tours booking office, 64 Cron St. Franz Josef Glacier if you are driving and don't require pick-up. A nice trip and the highlight for us was the history of the lake and Jurassic Rainforest hike that revealed nature at work! Dale was a great guide for the outing, very informative!